It’s been a while … I need to share more papertoys with the world. So here is another custom papertoy from me: GrummSkull. 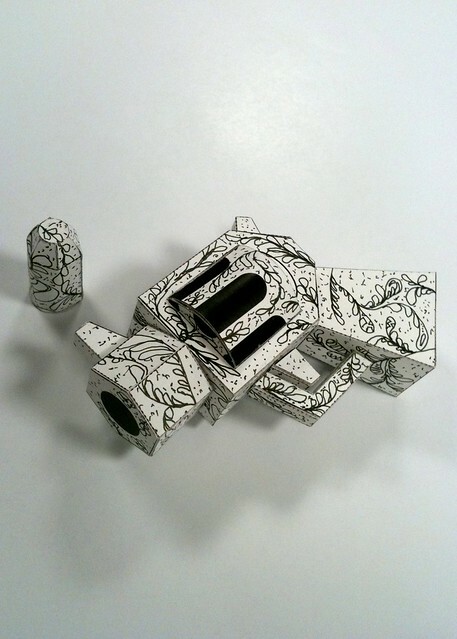 This papertoy is a custom based upon the paper skull from Patrick Pasques. The paper spring used is really great! Better then the spring I used for Drukks and much simpler! Check out Patrick’s work, its really amazing (blog is in French, but even without translation the images speak for themself) and support his work and buy his books! Post by Matthijs C. Kamstra. about 50+ reactions… love social! This year I was invited by Nick Knite to design papertoys robots for PAPER ROBOTS published by h.f.ullmann. I’m one of the 15 papertoy artists from all around the world and we produced 25 robots! The book is ready and its awesome! It will be in four languages (English, German, French and Spanish) and is already available on amazon for pre-ordering. Matt Hawkins, Marshall Alexander, Abz, Shin Tanaka, Castleforte, Dolly Oblong, Jonny Chiba, Scott Schallar and Vinsart. If you want to see more, here is a link to the product-page on ullmann-publishings website with more details and previews. Eventually there will be microsite on the Ullmann-website, where you can download free robots, some of them brand new and never released before!! The microsite on the Ullman-website is live! Get your free robots over there!!! Check more photos here, on HAKUSAI PROJECTS coverage of #up13 where we officially introduced the book to the public. Never heared of it… That because it self-proclaimed. And I’m one of the people who will do the self-proclaiming. I have written about it, showed you images/photos and now there is a special day for it! The papertoy book I have designed two monsters for published by Workman Publishing (strangly enough you can’t buy the book at Workman anymore). If you want to buy the book visit amazon.com and buy a couple of copies!!!. A breakthrough paper-folding book for kids�paper airplanes meet Origami meets Pokemon. Papertoys, the Internet phenomenon that�s hot among graphic designers and illustrators around the world, now comes to kids in the coolest new book. Created and curated by Brian Castleforte, a graphic designer and papertoy pioneer who rounded up 25 of the hottest papertoy designers from around the world (Indonesia, Japan, Australia, Italy, Croatia, Chile, even Jackson, Tennessee), Papertoy Monsters offers 50 fiendishly original die-cut designs that are ready to pop out, fold, and glue. The book interleaves card stock with paper stock for a unique craft package; the graphics are colorful and hip, combining the edginess of anime with the goofy fun of Uglydolls and other collectibles. Plus each character comes with its own back-story. You won’t find a lot of images of these Monster papertoys around on the Internet, I’m not sure but I think my paper models are rated advanced. Although you can see a part of the page where Squidbeak is at boingboing.net (check the first page of the book you see). 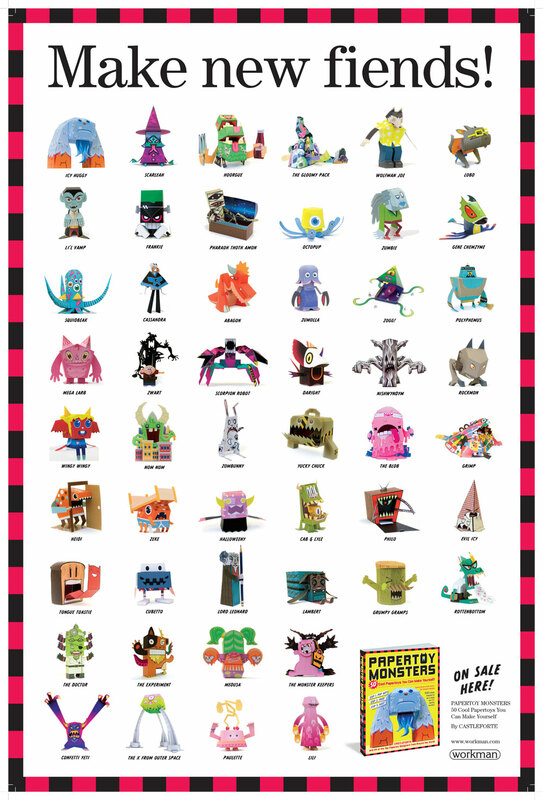 Castleforte posted a promotional poster for the “50 papertoy monsters” book which will be released very soon. 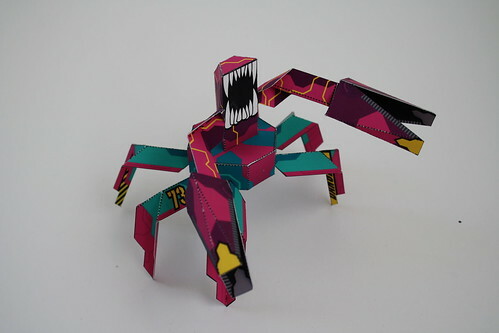 Castleforte: here is a sneak peak of all 50 monsters from my new, soon to be released book, �50 papertoy monsters�. thanks to workman publishing for this wonderful, promotional poster. enjoy! My monsters are “Squidbeak” (third row, first one) and “Scorpion Robot” (fourth row, third papertoy). 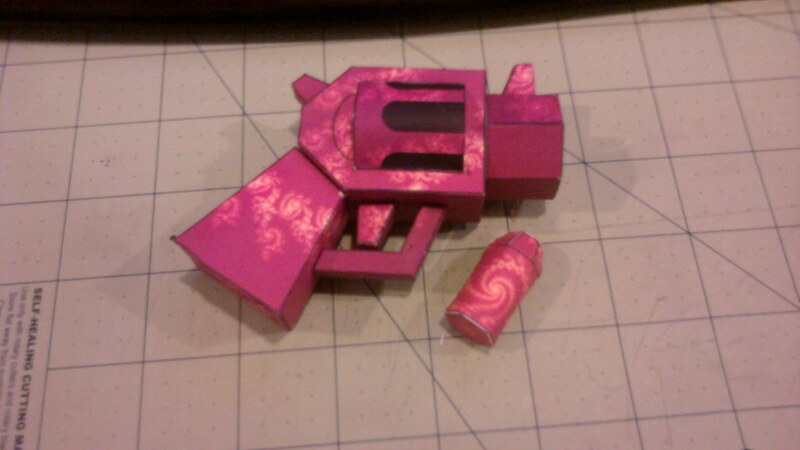 Revolvrr is a papertoy that I made as a part of an other papertoy. Nick Knite and Dolly Oblong advised me to share it with you. So here it is: it’s only a blank version because it just doesn’t need more. Update #1: in 48 hours more than 500 downloads. Everybody needs protection. So don’t bring a scissor to a papertoy fight! Update #2: in 6 days more than 1000 downloads. Throw your guns in the air. Tip from Methuup da Funky One: Glue the curved piece of the cylinder in first, apply glue and push the 4 half moons with the tabs which form the top and bottom of the cylinder from the inside into place. The first you need is a piece of paper with a print/pattern on it. Try Google for a pattern. You can buy paper with a print on it but you can also use a page from a comic/magazine/flyer. After that you just print the blank template on it. And remember: Revolvrr’s don’t kill people, scissors do! 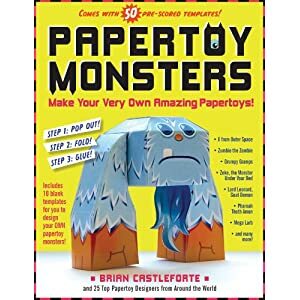 They are papertoy monster made for the Monsterbook by Workman Publishing Co.
Papertoy Monsters: Make Your Very Own Amazing Papertoys! . There are 50 monsters in this book made by 25 designers. 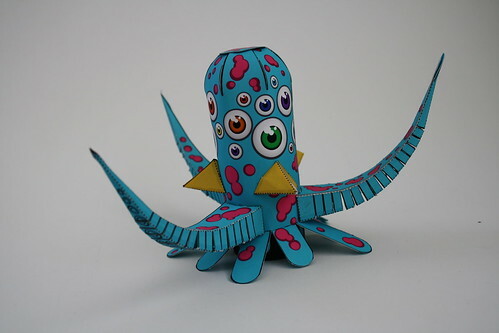 We were given the task to create monster papertoys on one piece of paper, with double-sided prints. They also asked to do some “classic” monster: I did a robot and a fictional monster. Check my flickr account for more images!